Boat is titled and currently registered. 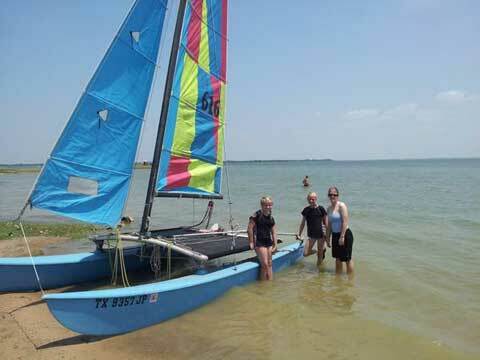 Hobie cat is in good condition. There is a little bit of softness on the sides of the hulls but the tops are very solid. Main sail is a racing type, it has a Mylar covering that is peeling off in spots, but that does not impede function at all. The boom for this sail has 6:1 Harken blocks (by themselves these are worth over $300 new). There is a second set of sails and boom, an original orange Hobie sail set that is worn but still works. It has some pin holes and has water stains and some fading in spots, the jib doesn't have any battens, and the boom has 4:1 blocks and is missing an out-haul cleat. The boat halyard rigging and jib sheets are fair condition - worn but fully functional. Main sheet is in very good condition. Composition tip mast. Standing rigging is in good shape, however the trapeze lines are starting to fray. The mesh trampoline and rug rails are about 3 yrs old and are in very good condition. Tramp has halyard line pockets and sewn in hiking straps. There is a brand new rudder on one hull. This is a solid old boat that has been well used but definitely has lots of life left in it if cared for. Trailer is currently registered, is in good shape, lights work, tires have tread left and the bearings are good. Trailer comes with a spare tire and has a winch mounted on it. 1-7/8" ball hitch. This boat/trailer combo is priced appropriately and will go to the first buyer with $800, firm, no trade/barter. Sold as is-where is, no warranty, no delivery. Please contact me to arrange a visit to have a look at it. It can be made available most nights and weekends. I am in Plano, TX. SOLD. Thanks so much for your service!